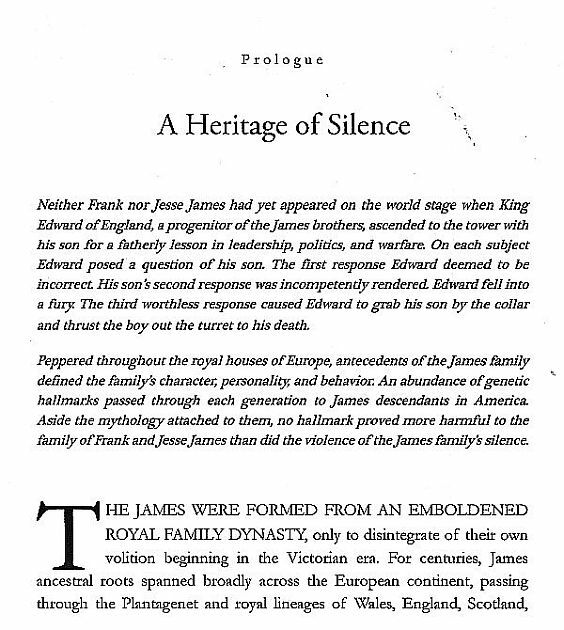 This Prologue sets the book's theme of conflict between the mythology of the James family & their factual reality. Searching the SURNAMES genealogy database of the James family's web site Stray Leaves, the royal ancestry of the James is evident, reaching far back to the biblical kings of Judea. When I first laid out the ancestral map of his family for Judge James R. Ross, Jesse James' great grandson joked, "Now I know where this awful nose comes from." But I had to correct him. Pictures of his historical Cole family confirm the nose Judge Ross disliked is a genetic inheritance from his Cole ancestry of Jesse James' mother, Zerelda Elizabeth Cole.